Good morning from the H-E-B Center at Cedar Park. 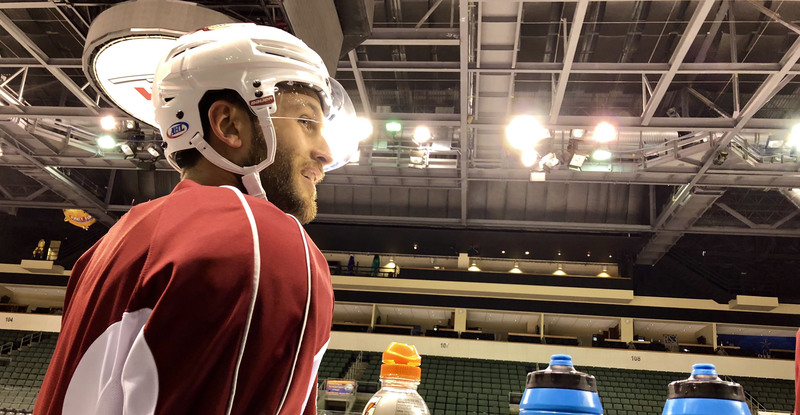 The Roadrunners took the ice at roughly 11:15 AM for a morning skate ahead of tonight’s Game 3 of the Pacific Division Finals series against the Texas Stars, a best-of-seven marathon set that’s tied 1-1 entering the evening. Mark your calendar for a 7:00 PM puck drop (5:00 MST). 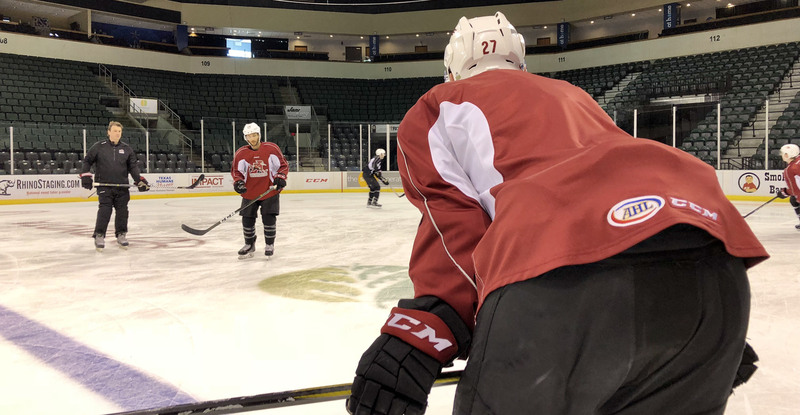 After arriving in the Lone Star State’s capital on Saturday, the team held a full practice on Sunday to begin preparation for three games in five nights for the road section of this second round series. We’re just shy of three months since the Roadrunners last played a game in Cedar Park; Tucson winning both of its regular season contests at the H-E-B Center in early February; a 5-2 victory on February 9, which was the franchise’s first-ever road win against Texas, and a 2-1 overtime triumph on February 10, Mike Sislo’s goal 50 seconds into the extra frame sealing the deal. 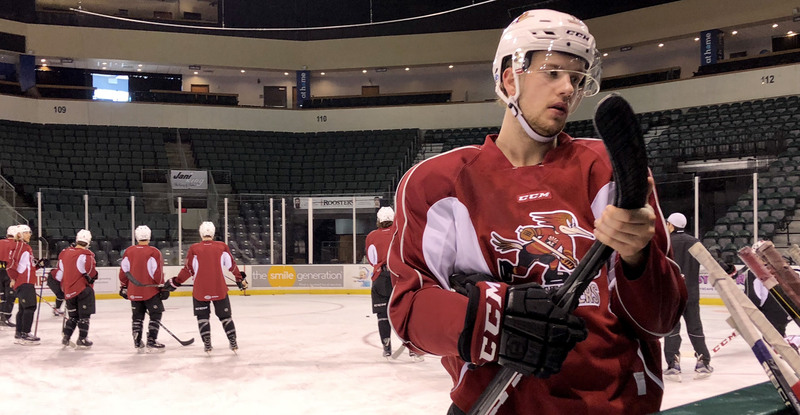 The Roadrunners, who finished the regular season with a .750 points percentage on the road, which ranked first in the Western Conference and second-overall in the league, have gone 1-1 away from home so far in the playoffs. I don’t think we had that bad of a game, I thought we had our chances, we’ve just got to get the puck past [Mike McKenna] and we’ll be fine. It’s good, the team’s feeling good, we’re definitely focused and ready to go tonight. We’re very confident for tonight’s game, and we’ll see how it goes. He’s a good goalie, he’s a veteran, he’s been around the league for a while, so he’s been in this situation before and he knows how to win. We’ve just got to get pucks to him. Anytime you get pucks to any goalie they start getting shaky, so that’s what we’re going to try and do, just get as many pucks at him as possible, and hopefully some of them will get by. He’s been great, he’s been great all through the playoffs for us, and last game was really only a 2-1 game for him with two of their goals being into an empty net. He’s playing great, hopefully he can keep it going, and he’s been very confident in the room. I think we need the first one for sure. This game is huge for us, you win this first one on the road and you feel a lot better about yourself. For any team, especially in the playoffs, playing on the road is hard. I’m sure tonight will be loud and the atmosphere will be great, but it’s always fun to beat them in their own building. More to come from the H-E-B Center.